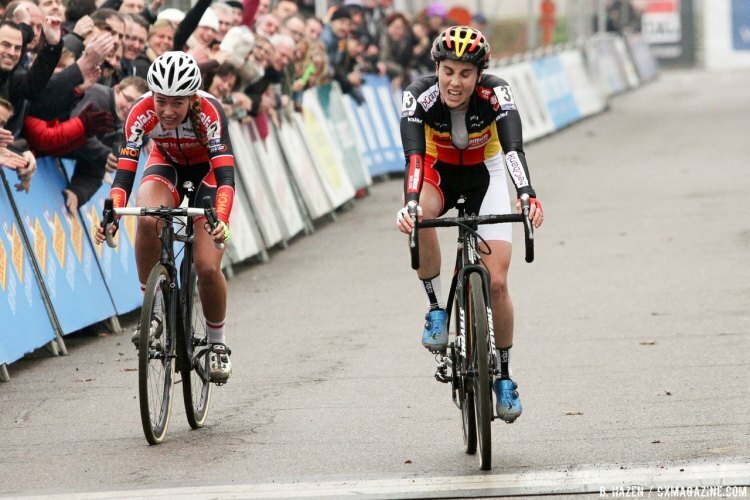 After a close photo finish at Noordvlees Van Goolen Cyclocross Essen, both Sanne Cant (IKO Enertherm Beobank) and Sophie de Boer (Kalas-NNOF) were clearly motivated to not leave another race to the finish line cameras and instead have time to enjoy a finish line victory celebration. For most of the race, it looked like it would be De Boer who would get her wish. 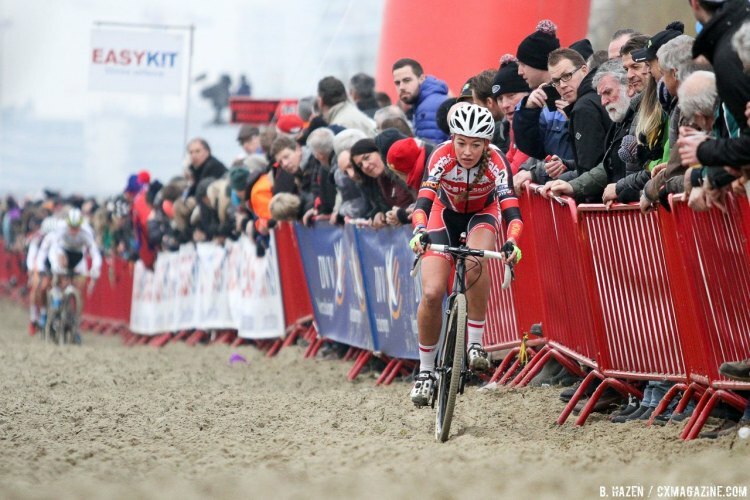 The 2016 Scheldecross course was an even mix of flat power-straights, well worn in from previous races, deep sand pits, which required riders to complete tight 180-degree turns or complete long run sections, and steep climbs and descents linked together by tight turns. Each feature type was grouped together, resulting in a relentless track, allowing riders almost no recovery time. Spectators were out in strong numbers, donning black puffy coats and umbrellas, on a day as gray as the nearby lake. Despite the drizzle, the course appeared to be tacky throughout, with only a few mud slicks in the trees. Sophie de Boer (Kalas-NNOF) was a clear spectator favorite, with large banners featuring her face visible on many points throughout the course. 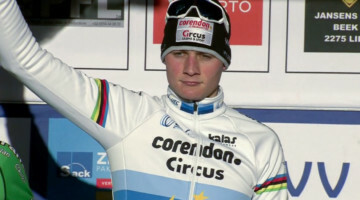 The black horse for this race was Marianne Vos (Rabo-Liv), for which Scheldecross was the first race back after a two year-long break from ’cross. Fresh off a dominant win at Durviencross in Overijse, De Boer dominated most of the race, commanding a strong lead after taking the holeshot. Some early bunch-ups in the series of steep climbs gave the first fifteen riders a sizeable gap over the rest of the field. 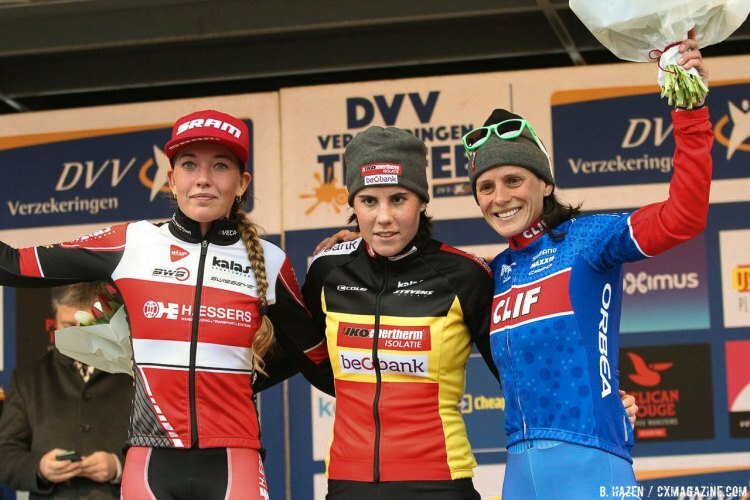 Vos charged early to set herself up for a strong position in the top ten, and she looked strong and comfortable, consistently sitting behind first wheel in an early-formed De Boer chase group, despite shuffling for position by other racers in the group. American Kaitie Antonneau (Cannondale-Cyclocrossworld), who had been working with a few riders that were shot off from the leaders, worked her way up to the lead De Boer chase group of Katerina Nash (Luna), Cant, Vos, and Thalita de Jong (Rabo-Liv) through the last sand pit straight, but couldn’t hold onto De Jong’s wheel in the long power-sucking grass section. Antonneau would end up with yet another top-ten finish in eighth. 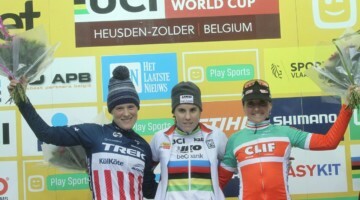 De Boer maintained a 19-second gap throughout much of the race, losing some of her lead through the steeps, and regaining her lead in the sand, where she never faltered. While some riders attempted to ride long into the deep pits, De Boer’s smooth dismounts and remounts, along with a strong running stride, gave her a clear advantage in the sand. Behind her, the main chase group, consisting of Nash, Vos and Cant, looked to be racing for second, with De Jong trailing behind, the lead group just barely out of reach for her. The bell rang for the final lap, and a smile seemed to spread across Cant’s face. She appeared to have been holding on to some energy, and closed a significant amount of De Boer’s gap by spending long stretches out of the saddle. De Boer faltered slightly while clipping back into her pedals after the barriers, giving Cant a chance to close her advantage down to seven seconds. Suddenly, those seven seconds were gone. After looking over her shoulder for the first time all race, De Boer saw that she was in for an Essen rematch (watch that fantastic finish here). Cant caught De Boer’s wheel after the second sand pit, where both racers had to navigate lapping a sizeable amount of riders. Coming onto the last stretch of grass before the chute drop to the final pavement straightaway, both women were out of the saddle sprinting. They charged hard, with Cant pulling ahead and sprinting through the finish to take the win by a bike length. Needless to say, there was no finish line celebration for Cant after last weekend’s close call. Nash, who finished 10th in USA Cycling’s Pro CX rankings this season, was 45 seconds behind Cant at the finish to take third. Nash maintained a large gap over Vos, who had shown signs of fatigue during the third lap after spending most of the race pushing the lead chase group pace. Stay tuned for the Men’s race report from Scheldecross and check back tomorrow for full coverage of the UCI Cyclocross World Cup in Namur. Nash was 45s behind Cant at the end, not 15. Right, that’s exactly what the results say. Thanks. Fixed. Kinda gutted for de Boer. She lead the race from the start to a few meters from the finish. Cant is the real deal though! nice result Sanne ! Congrats ! !